In step two the synthesized bass and programmed drum tracks have been removed from the new song, and replaced with the bass line and drum and percussion parts from the existing song. The drum and bass parts constitute the core of the ‘rhythm section’ of the song. At once the flavour of the new song changes, with the new parts adding a fresher feel. The drum and percussion parts of the existing song employ an insistent opening and closing hi-hat cymbal on each quaver, coupled with tambourine semiquavers, which add considerable brightness with their high treble frequencies in the sonic spectrum. The existing song’s bass line is ‘punchier’ and also sparser, with gaps between the notes. The existing song’s bass line is heavily syncopated, with several rests, typical of the style of disco-funk. The first two beats of each bar repeat the same “dum . . . duh dum dum” figure, and the third beat of each bar has a rest on the strong beat, a common feature of funk music, where the first beat of the bar (known as ‘the one’) delivers the ‘punch’. The bass line in the new song is less complex, describing descending triads around the chords of A and D, again mostly employing quaver beats. One significant difference between the two is that the existing song’s bass line remains rooted to the note of A for the first three bars, even though the harmony above it in the second bar changes to D. This device of a static bass line in music is known as a ‘pedal note’, and has the effect here of reinforcing the feel of the key note (in this case the tonic chord of A major), so that when it finally moves away there is a stronger feeling of harmonic freedom. The bass line from the existing song contains some features that point to accomplished musicianship – particularly in the use of notes other than the tonic, or root note, of the chord, as described above. A further striking example, albeit of just one note, is where a D# is used over a B chord just before the final chorus, playing what is known as the ‘first inversion’ of the B chord. A case for infringement of this version would highlight these examples as showing original skill in the bass line of the existing song, which were copied into the new song in the second step. Many of the rhythmic patterns of the existing song’s bass line are commonplace, and it contains little that is especially original or melodic in isolation. If we contrast the existing song’s bass line with more melodic bass lines such as The Beatles’ Day Tripper, or Queen’s Another One Bites The Dust, these can be argued to constitute a more integral part of the whole song. An unauthorised 1990 sample of the two-second bass hook from Queen and David Bowie’s 1981 song Under Pressure by American artist Vanilla Ice resulted in a costly out-of-court settlement, so fundamental was John Deacon’s original bass hook to the whole work. According to press reports Vanilla Ice paid a $4m settlement and a percentage of future royalties to Queen and David Bowie. It is perhaps significant to mention that Rutger Gunnarsson, the player of the Original Work’s bass part, is not given a writing credit or royalty share, implying that the bass part to the original work was not considered a significant part of the copyright. It would have been standard practice for him to be paid a ‘buyout’ session fee for his performance, in exchange for the signing of an agreement waiving claim to any future royalties. Mr Gunnarsson died in April 2015. 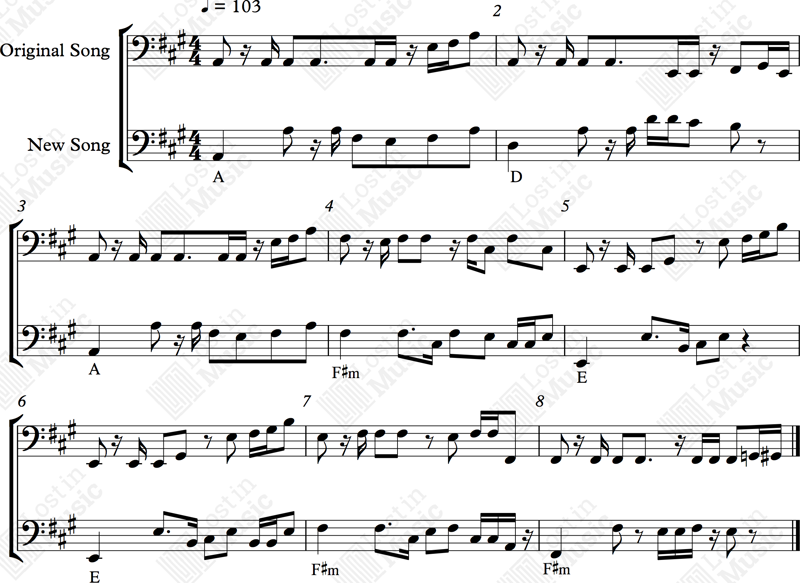 While the new song’s drum pattern is simple, the existing song adds syncopation to the snare drum, placing an extra hit one semiquaver after the third beat of the bar, in addition to the standard hits on the second and fourth beats. No claims could be made for originality here, however, as this syncopated snare pattern is commonplace in disco-funk music, enjoying currency since the late 1960s, for example the bridge section of James Brown’s She’s The One, recorded in 1969, the bridge of Mother Popcorn and the main groove of You Got To Have A Mother For Me, both also recorded in 1969. For a disco/R&B example see Walking In Rhythm by The Blackbyrds, recorded in early 1975. The score below presents a comparison of the bass lines of the two works and illustrates considerable variation. The question is whether the bass and drum tracks of the existing song are copyrightable in their own right. (Simon Anderson) ©and ℗ 2015, Simon Anderson. Please note that copyright is only claimed in the original elements of See You In Court, and not in the elements that have been reproduced from the existing song for the purposes of this case study. In step two, the new song still retains its own identity. The changes introduced by the new bass and drum parts can be considered cosmetic. The melody, lyrics and bubbling synthesizer accompaniment to the new song override the foundations of the bass and drum tracks. In spite of the acknowledgement that the whole bass part has been copied, it is felt that this still does not constitute a significant part of the whole existing song, and therefore no infringement is committed. Compare this scenario with Beckingham v Hodgens, where a solo violin part of The Bluebells’ 1983 hit Young At Heart was deemed to have a copyright of its own and an entitlement to a share in royalties, due to its melodic originality and its prominence in the song as a whole. It is hard to imagine the bass player or publisher of the existing song making a similar claim for a share in copyright in this example. Let us know your thoughts on this You Be The Judge case. To add your comments you will require an account. Please either Login or Register.